Now that’s something I can sink my tooth into. These salmonberries are so pretty! But the orange ones are still a little sour. 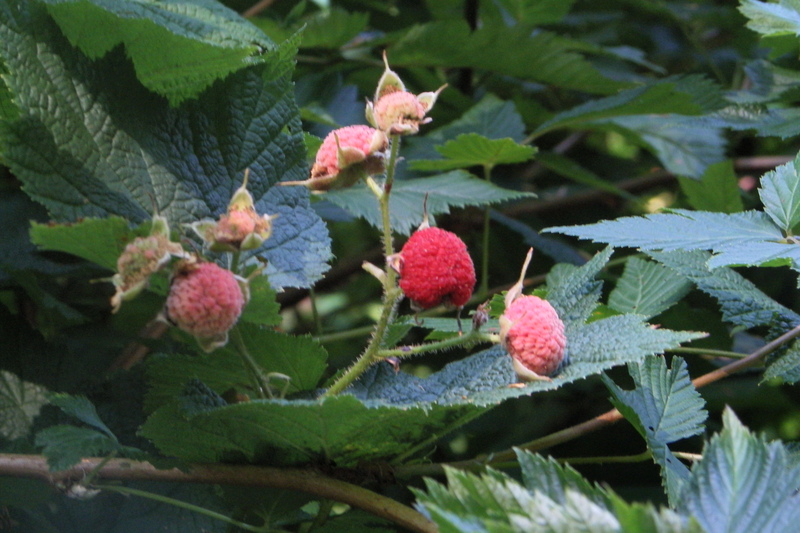 Salmonberries begin ripening in late June to early July, depending on the elevation. 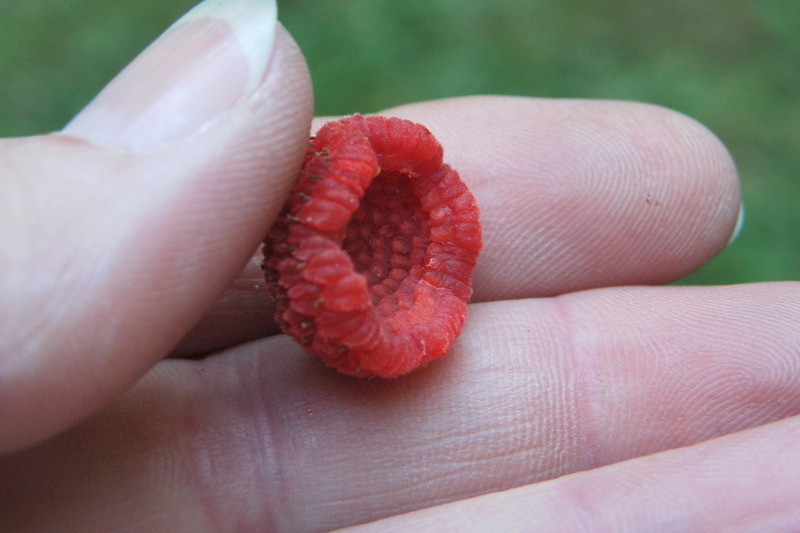 I only found a couple ripe salmonberries. The red ones are sweet. I like them even a little redder than this one. 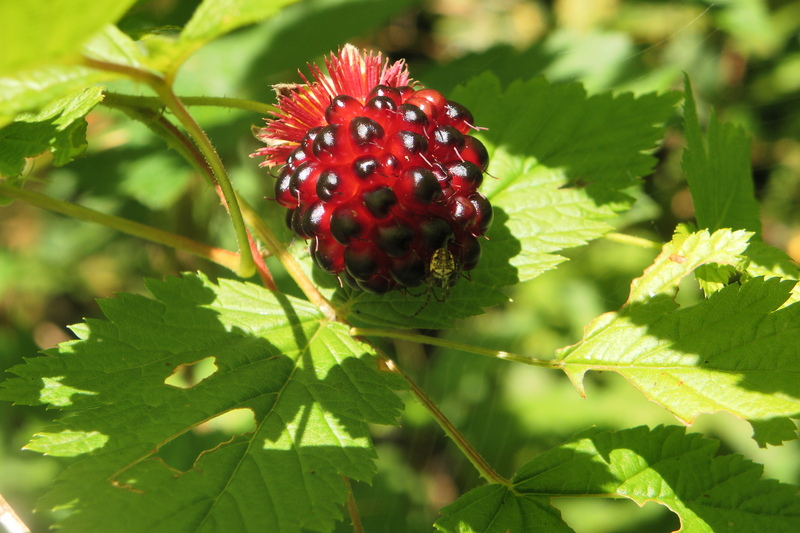 Horse Creek Campground has lots of salmonberries and thimbleberries. 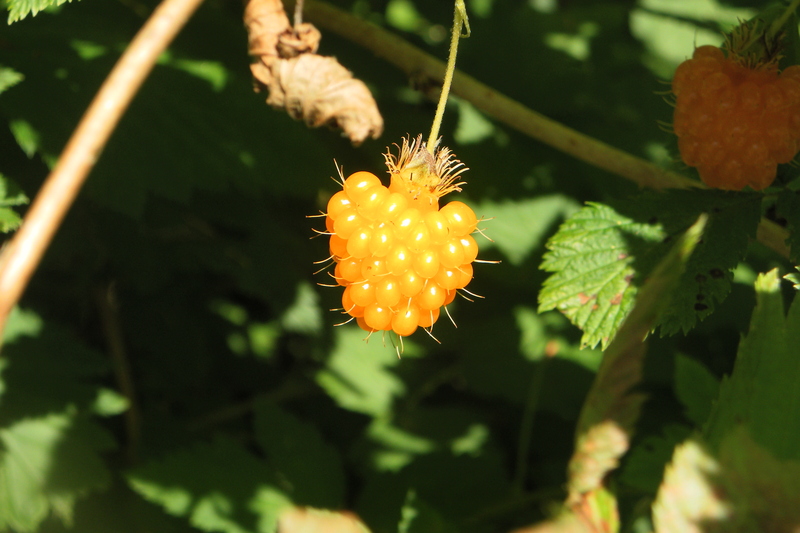 The thimbleberries are just starting to come on but it seems like they ripen faster than the salmonberries. That red one is ready to eat. 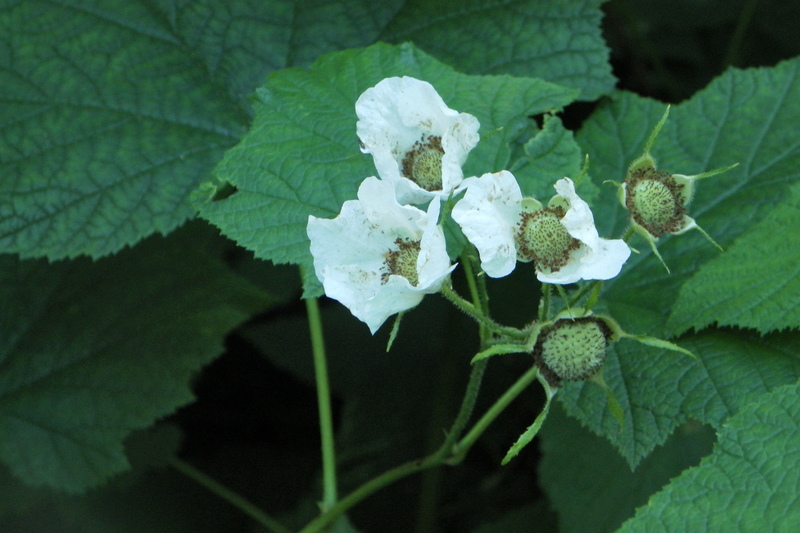 The thimbleberries remind me of a hollow strawberry. The flavor is similar and the tiny seeds crunch between your teeth. They are very delicate. The berries are easy to squish when you pull them off the plant. And they almost have a slight fuzz on them, like a peach fuzz. 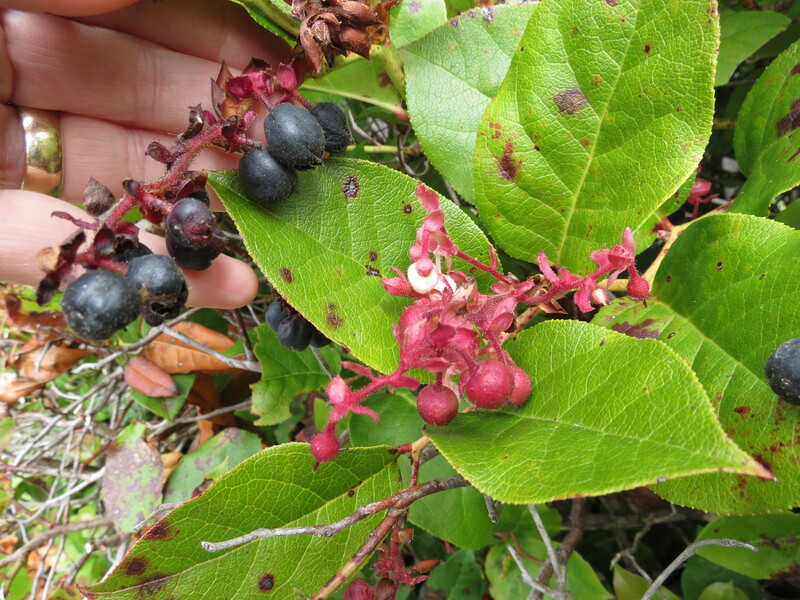 In mid to late-July the Salal Berries ripen. They taste like a blueberry. The ones near the salt air of the ocean get a slight salty crust on them; to add a yummy dimension. And, of course the blackberries can’t be missed. 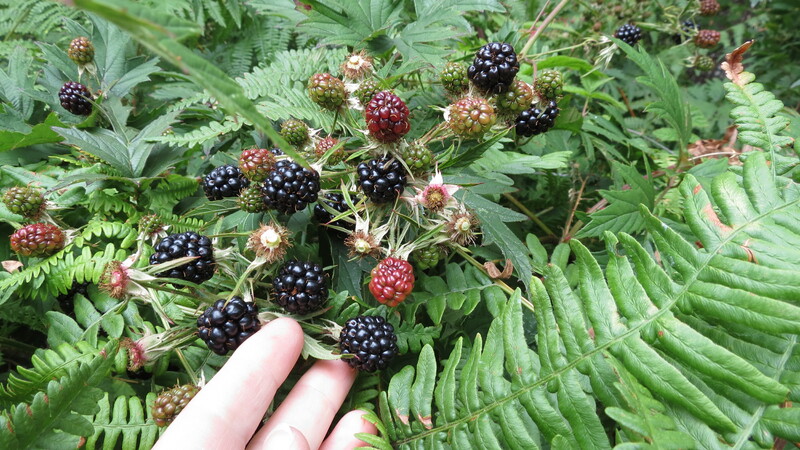 There are a couple different varieties of wild blackberries. Himalayan is one and I think the other is either called Evergreen or Trailing? You see them covering the roadsides and fields and old cars and houses! The ones along many of the roadsides are sprayed for weed-control; so don’t eat those. I love the Oregon coast for the beach and the sunsets – but the coast even tastes good! trying to find a way to contact you to ask if we could use one of your images. thank you!